19.90 metres @ 89.08 g/t gold equivalent, including a spectacular sub-interval of 0.50 metres @ 3,194.51 g/t gold equivalent (1,267 metre-elevation). 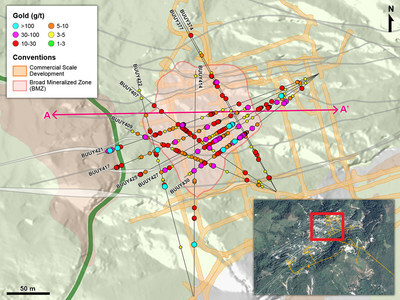 5.60 metres @ 48.77 g/t gold equivalent (BUUY377, 1,495 metre-elevation)BMZ1's vertical extent now totals more than 400 metres and the drill results reported herein highlight the potential for future mineral resource expansion. 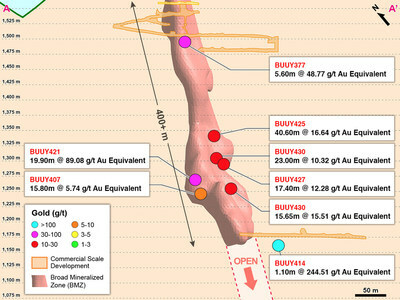 1.05 metres @ 22.89 g/t gold equivalent (BUUY414, 1,157 metre-elevation).Given the close proximity of the high-grade gold intercepted in this hole to the future processing plant currently under construction, additional drilling will be carried out to ascertain if a new high-grade pay-shoot can be outlined for potential mining in early production years. TORONTO, Feb.12, 2019 /CNW/ - Continental Gold Inc. (TSX: CNL; OTCQX:CGOOF) ("Continental" or the "Company") is pleased to announce additional high-grade assay results from 12 holes drilled into the Yaraguá system as part of the drilling program at its 100%-owned Buriticá project in Antioquia, Colombia. The Company plans to drill up to 73,500 metres in 2019, consisting of approximately 55,000 metres of capitalized definition drilling and approximately 18,500 metres of exploration-led infill drilling primarily targeting the broad mineralized zones ("BMZ"). "Buriticá continues to impress. On January 30, we announced an updated mineral resource estimate, which delivered significant across-the-board growth and ranks our Buriticá deposit alongside a very scarce list of deposits globally in terms of size and grade. The Buriticá global mineral resource inventory now sits at slightly greater than 12 million gold equivalent ounces at over 10 grams per tonne (see Table 2). The drill intercepts reported today remind us that the Buriticá system is far from defined and will continue to grow well into the future. We look forward to receiving results from the combined 73,500-metre definition and infill drilling program planned for 2019," said Ari Sussman, CEO. "Most importantly, construction of the Buriticá mine remains on schedule for first gold pour in H1 2020." For exploration and infill core drilling, the Company applied its standard protocols for sampling and assay. HQ and NQ core is sawn or split with one-half shipped to a sample preparation lab in Medellín run by ALS Colombia Limited ("ALS") in Colombia, whereas BQ core samples are full core. Samples are then shipped for analysis to an ALS-certified assay laboratory in Lima, Peru. The remainder of the core is stored in a secured storage facility for future assay verification. Blanks, duplicates and certified reference standards are inserted into the sample stream to monitor laboratory performance and a portion of the samples are periodically check assayed at SGS Colombia S.A., a certified assay laboratory in Medellín, Colombia. For stope definition core drilling, the Company applied its standard protocols for sampling and assay. The HQ3 samples were full core and provided sample widths between 0.2 to 1.0 metres weighing approximately 2 to 8 kilograms. Custody of the Samples were transferred at the mine site to Actlabs Colombia using rigorous chain-of-custody procedures. Full-core HQ3 samples are prepped and analyzed at Actlabs Colombia's ISO 9001 accredited assay in Medellín, Colombia. The remainder of crushed rejects and pulps are stored in a secured storage facility for future assay verification. Blanks, pulps duplicates, coarse duplicates and purchased certified reference standards are inserted into the sample stream to monitor laboratory performance. A portion of the samples are periodically check-assayed at ALS Peru's ISO 9001 accredited assay laboratory in Lima, Peru. For information on the Buriticá project, please refer to the technical report, prepared in accordance with NI 43‑101, entitled "Buriticá Project NI 43–101 Technical Report Feasibility Study, Antioquia, Colombia" and dated March 29, 2016 with an effective date of February 24, 2016, led by independent consultants JDS Energy & Mining Inc. The technical report is available on SEDAR at www.sedar.com, on the OTCQX at www.otcmarkets.com and on the Company website at www.continentalgold.com. This press release was prepared in accordance with Canadian standards, which differ in some respects from United States standards. In particular, and without limiting the generality of the foregoing, the terms "inferred mineral resources," "indicated mineral resources," "measured mineral resources" and "mineral resources" that may be used or referenced in this press release are Canadian mining terms as defined in accordance with National Instrument 43‑101 – Standards of Disclosure for Mineral Projects under the guidelines set out in the Canadian Institute of Mining, Metallurgy and Petroleum (the "CIM") Standards on Mineral Resources and Mineral Reserves (the "CIM Standards"). The CIM Standards differ significantly from standards in the United States. While the terms "mineral resource," "measured mineral resources," "indicated mineral resources," and "inferred mineral resources" are recognized and required by Canadian regulations, they are not defined terms under standards in the United States. "Inferred mineral resources" have a great amount of uncertainty as to their existence, and great uncertainty as to their economic and legal feasibility. It cannot be assumed that all or any part of an inferred mineral resource will ever be upgraded to a higher category. Under Canadian securities laws, estimates of inferred mineral resources may not form the basis of feasibility or other economic studies. Readers are cautioned not to assume that all or any part of measured or indicated mineral resources will ever be converted into reserves. Readers are also cautioned not to assume that all or any part of an inferred mineral resource exists or is economically or legally mineable. Disclosure of "contained ounces" in a resource is permitted disclosure under Canadian regulations; however, United States companies are only permitted to report mineralization that does not constitute "reserves" by standards in the United States as in place tonnage and grade without reference to unit measures. Accordingly, information regarding resources contained or referenced in this press release containing descriptions of our mineral deposits may not be comparable to similar information made public by United States companies.